Never shall the cross forsake me: Lo! it glows with peace and joy. Our one hope in Jesus Christ will never deceive us; however, our many hopes for this life’s personal fulfillment may. This is our tendency to “wish” for things to happen, not our confidence in Christ. These wishful-thinkings can deceive us… even drive us mad if we’re not careful. The film NEBRASKA is about a man who believes he has actually won the $1,000,000 as told by a flyer that came into everyone’s mailbox – and travels across country to claim it. That’s a great example of hopes that deceive, wishes that betray us or lead us astray. I think you get the picture without my giving you a list from my own embarrassing experiences. We’ve already talked about my tendency to live in fear; and if you are in that pothole with me, you understand how “fears annoy.” Sure, they claw at you all the time causing worry and distress, but worst of all, they hold you back from doing what you KNOW you should do – even what you believe yourself called to do. A recent sermon on David and Goliath made me more-totally-than-usual aware of my inability to face my fears and slay my giants. Perhaps that sermon and this hymnline will spur me on to good works – works that happen because I am slowly being freed of that proclivity. Of course, the point of this hymn’s second stanza is that when the woes, deceits and annoyance of this life overwhelm us, we can rest assured that the Man of the cross will not abandon us, and that image of up-stretched timber serves as a constant reminder. Today, you are likely to encounter many crosses: displayed on walls, hung around necks, atop church steeples, etc. Let each one remind you that even if you are convinced that you are drowning in the cares of this life, you are “no, never alone” – your REAL hope is still here. "This is my Father's world, I rest me in the thought." I can relax because my Heavenly Father is in control. In the midst of turmoil and unrest – worldwide and within – I can truly be un-worried because unlike Leonardo DiCaprio, God IS the King of the World! 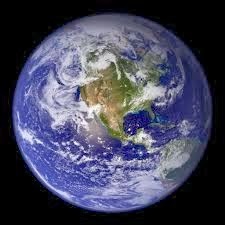 I am not one of those who believes that God created the world, then walked away to let it develop on its own. He did not invent the universe and unconcerned, step away from the control panel. As long as I am convinced that he is Omnipotent, I can rest me in that thought… and that on his timetable things will realign, and all will be well. I’ve admitted already that I am a worrier, so this hymnline reminds me that I need not be. That doesn’t mean that I have conquered my worrying spirit, but in the overall big picture, I am at peace. We’re always told to “just turn it over to God”; sometimes I think we need to turn it over to God’s timing. If the world… the universe… is his, and – as we’re told later in the hymn - “God is the Ruler yet,” we can face most any dilemma if we’re willing to wait. 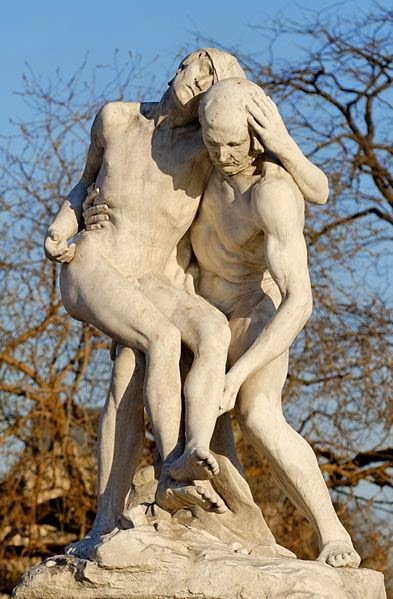 "Weep o'er the erring one, lift up the fallen." This simple hymnline lifted from an old familiar gospel song is a pretty good description of what it means to be compassionate. I grew up in a church where we sang this one briskly like a John Philip Sousa march. Until I used David Schwoebel’s setting of it near the end of my full-time music ministry, I had never paid much attention to the text. That is one of our ‘sins against the hymnal’: we just don’t take note of the words. Fanny Crosby definitely had a way with words, and hidden deep within many of her gospel-songs we find these kernels of truth that help us understand certain of aspects of our faith put into words that we can understand more clearly if we take the time to zero-in on the separate phrases – like this one. Weeping over those whose lives have gone wrong, who have stumbled and fallen, whose blumbers have sent them down a negative pathway – that’s how the Spirit of Christ within us reacts; we feel compassion on those struggling ones. But for compassion to be effective, we must move beyond the feelings to action. We have to stop what we’re doing and give them a hand; we have to lift up those over whom we weep. If you need a story to help you understand this concept, read Jesus’ parable of the Good Samaritan in Luke 10. Lots of people saw the down-and-out ditched man, saying to themselves, “Bless his heart.” But the man from Samaria had compassion on him and did something about it. May this hymnline prompt us to practice compassion – not as a feeling, but as a natural active response. "Love so mighty and so true merits our soul's best songs." I was never a Boy Scout. There are reasons for that – most of which come back to my mother not wanting me to go to the Methodist church one night a week! :) By the time she got over that phobia, I had graduated from college and was no longer eligible for scouting! 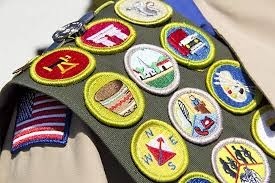 But I DO know about merit badges: they are given to those who deserve them for their hard work and ability… even talent. Some are given in spite of lack of ability in a discipline because they overcome that deficiency to achieve what may have seemed like impossible goals. This hymnline tells us that the mighty, certain love of God – Agape – deserves our best song. Our never-deficient Savior warrants all our songs… but especially our best ones. As a worship-planner/preparer for many years, song-selection was a mammoth task for me because I grew up singing this hymnline… and others akin to it: “Give of your best to the Master” comes to mind. I learned early on that it is not our best use of time in worship to put into the mouths of our singers songs that are mediocre; I was (and am) convinced that God’s merit (his intrinsic value) merits only the best texts and melodies aimed in his direction in corporate expressions of praise, faith and testimony. How many Christian songs do you think exist out there through history up until now? WAY more than any of us can comprehend. Even if we consider only the ones which have been published, we are overwhelmed with number. And even more complex, how does any human determine what is the best of that approaching-infinity total? At least we can discard a bunch that don’t seem to stand the tests of music and text… those which have not stood up well over time. It’s probably more complicated to select the best from the NEW crop of songs, hymns and anthems! Before this turns into a philosophy of church music essay, let me just say that this much I know: God deserves our best songs… though determining those may be up for grabs. If our Lord were a Boy Scout, he’d have one of those green shoulder-to-belt sashes on which to place his merit badges. That would have to be one-heck of a big sash to contain the whole of his merit badges… and it would have to be constantly growing to make room for more. This love so mighty and so true has lifted me; now it’s my turn to return the favor by lifting him up in song… the best songs I can find or recall.